If all one ever heard or read were the successful accounts of black athletes and entertainers, one might come to the conclusion that, being black in America is a cake walk. But, as the song writer crooned, "It ain't necessarily so. 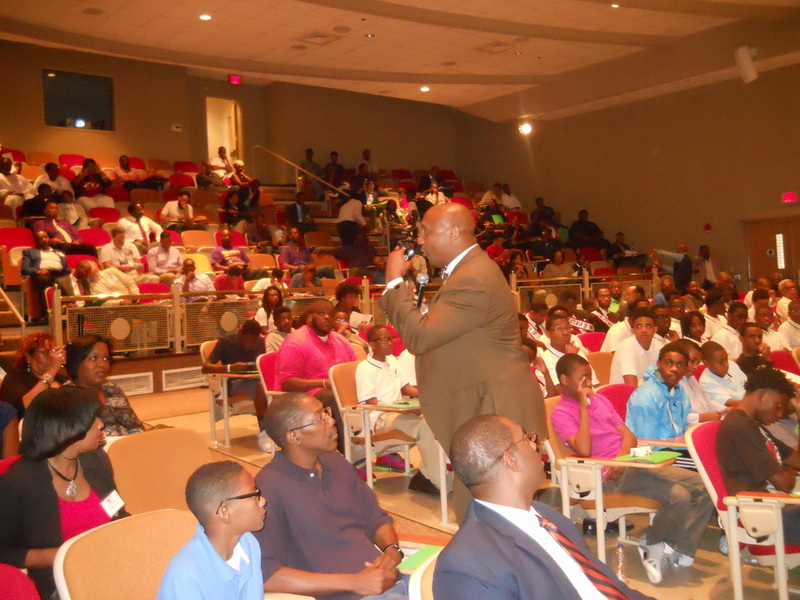 . ."
The Community Council of Metropolitan Atlanta in partnership with Morehouse Research Institute kicked off its third annual Black Male Empowerment Expo on Saturday, September 20, 2014. The event was held at the Shirley Massey Executive Conference Center and attended by more than 300 participants. But as Norma Joy Barnes, CEO of CCMA, noted in her remarks, “what is needed to effectively respond to this moment is “bold, courageous leadership.” And I believe that the way to quantify hope for young black males is by creating an awareness of the acute nature of the problems facing young men of color. We must implement an array of innovative educational programs aimed at preventing hardships and addressing the particular needs of black males; programs like the Priority Male Initiative (PMI) sponsored by CCMA. “We need initiatives that include life skills, mentoring and job training programs which train and help participants find employment.” According to Barnes, "the barriers to success that black men face have been in plain sight for decades, so it is particularly heartening to see a movement taking shape that is specifically crafted to address these challenges and to change the odds for one of the most disenfranchised populations in America. We are moving in the right direction, stressed Ms. Barnes, but we need to accelerate the pace! Attendees departed the Expo with hope in their hearts and a better understanding of the need for community coalitions to address the issues that negatively impact black males. The unprecedented levels of incarceration, unemployment and discrimination in America are having widespread consequences for this group. Clearly, more support services are needed. At the same time, policymakers, service providers, and community organizations need to focus on the ripple effects of long term punitive policies and the opportunities to implement systematic and coordinated efforts to reduce the negative harms inflicted on men of color. Advocates, activists, parents, community leaders and social service organizations were represented. Attorney Mawuli Mel Davis and moderator Al Duncan delivered inspirational messages. Attendees enjoyed a bag lunch provided by the Chick-fil-A Foundation, a community partner. Editorial Note: Judy Jordan is a community activist, educator and writer. She served as the Community Service Manager for Community Council of Metropolitan Atlanta, Inc.
"CONVERSATIONS WITH YOUNG BLACK MEN: A REALITY CHECK"
On Wednesday, Sept. 18, 2013 I attended the “Conversations with Young Black Men: A Reality Check” conference at the Hickman Student Center at Morris Brown College. The event was a collaborative initiative between the Community Council of Metropolitan Atlanta, Inc. (CCMA), Morris Brown College, and The Local Take/WCLK Radio Station. And tell us they did. I would estimate that there were about 40-50 black men in attendance, an even mixture of young brothers and older heads like myself. From what I could determine, the older brothers in attendance represented many walks of life including the ministry, fraternities, the criminal justice system, academia, health and human services, and various community-based social outreach programs. After the customary welcome, introductions and pizza lunch, the women in attendance were asked to leave the room, and the men formed a “conversation pit” circle with our chairs and the discussion was expertly moderated by David Branch, a local Community Organizer. David asked the younger brothers to go around the circle and introduce themselves and he encouraged them to be open and honest and to share with the group what was going on in their lives. The young brothers told stories about smoking weed every day; wrestling with the responsibility of being a young father; having trouble finding a job; the challenges of readjusting to society after being incarcerated; growing up without a father – and in some cases without a full-time mother; feeling alienated being a minority on the college campus as well as in corporate America; and wanting to start their own business. Many of the stories they told were heart-wrenching, full of despair, and the result of making poor choices. After the younger brothers had had the opportunity to express what was on their minds, we broke up into smaller, individual groups at separate tables by discussion topic including Life Skills, Education, Employment, Fatherhood, the Criminal Justice System, etc. I chose to sit at the Life Skills table. I gathered that each of the older brothers sat at a table where they had some area of interest and/or expertise. At our life skills table, when one older brother started to dominate the discussion, I had to pull him back and remind him that we were there to hear what was on the young people’s mind – we were not there to preach or to lecture to them. We were there to listen and to give advice. It was obvious to me that throughout this entire process that 1) the younger black men were open and looking for feedback and input from the older brothers and, 2) the older brothers relished the opportunity to hear what was on the young brothers’ minds and what they had to say. At our life skills table, we talked about developing the ability to get along with people and about taking personal responsibility for your own actions. At one point, one young brother asked us, “So what questions do you (the older heads) what to ask us?” My first response was, “What’s up with all of the violence? What has happened in your life that makes you so angry and cold that you could shoot another person or a mother and a little baby in a stroller?” The responses dealt with the fact that some young black men have been so marginalized and alienated by society that they feel that nobody cares about them, so why should they care about anybody else? I told the young brothers that many of us older men are afraid to say anything to them – like “Pull your pants up” – because they look so angry and menacing on the street. In many cases, we’re afraid of you. My day at the “Conversations with Young Black Men” meeting was one of the most invigorating and energizing events that I have participated in as it relates to dealing with our young men. As I said at our table, I rarely – if ever – get the opportunity to have an open dialogue with our young black men. This is exactly what’s missing – the opportunity for older brothers to sit around the table and talk to our young men. What a novel idea! It was evident that many of the young men who were there grew up in single parent households, without the benefit of having any male role models. Also evident was the fact that many of the male role models that they did have were negative influences. Having heard first hand from the young men in attendance, it is clear that our young black men are in pain. They are hurting and they don’t have anybody to talk to. They have something to say and they have stories to tell. As older brothers, fathers, and leaders in the community, in order to understand what our young men are going through, we have to come to the table and listen to what they have to say. At the very least, we can be shoulder to lean on, or an ear to listen in a non-judgmental way. I called Ms. Barnes of the CCMA after the event to thank her inviting me and for being a visionary and pulling this event together. It wasn’t her first. I told her that we need to continue having these meetings on an ongoing basis – at least once a month. I believe that a program like this has the potential to become a national model for opening up a much needed dialogue between older and younger black men. Let’s keep this going. Let’s talk to our young men and hear what’s on their minds. Let’s be there to share with them the skills and strategies of how we have been able to survive as black men in America. If we can’t be there for them – then who will? 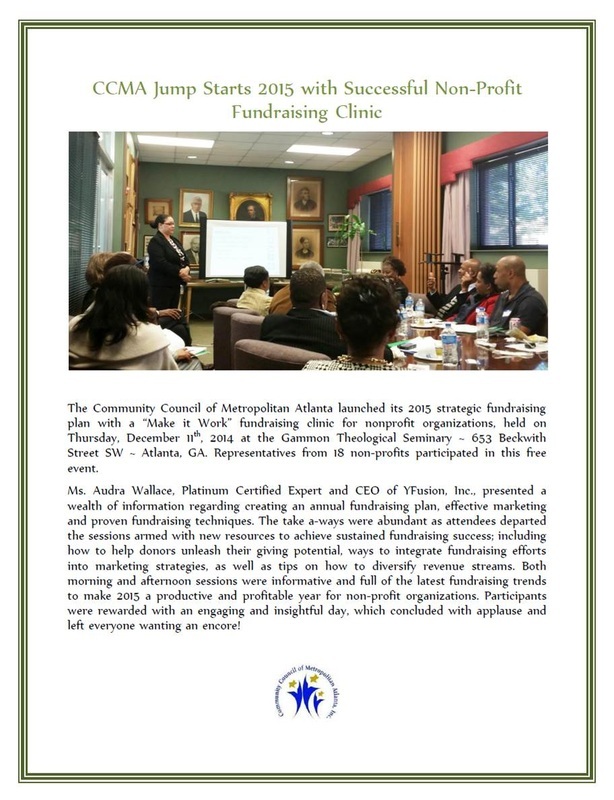 You can reach Ms. Norma Joy Barnes, CEO/President of the Community Council of Metropolitan Atlanta at (404) 935-5857 or at www.communitycouncilma.org. Note: Al Wiseman is the Founder of Young Speakers, Inc., an author, award winning marketing and sales professional, and a community service volunteer. He can be reached at (404) 932-9434 or online at www.youngspeakersinc.org. My name is Levi Idowu and I am 27 years old. I graduated from Booker T. Washington High School in 2005. Growing up, life was not always good; I grew up poor and spent some time in foster care. Although I never hung around the wrong crowd, I always seem to make poor decisions and thought I knew the best way to go about doing things. I always seemed to be starting over despite my parents always instilling in me a good work ethic, and attitude, as well as encouraging me to be respectable to my elders. After high school, I continued to struggle, unable to maintain employment, independency, and self-sufficiency. I always found myself constantly changing jobs, starting over, being unable to keep up my independency, and maintaining self-sufficiency for about 4 years. I knew then my life started to take a complete turn around to achieving nothing coming out a high school. I knew I lacked some personal skills, or some type of qualities that jobs look for in people or even networking abilities because I did not have the right people around me. Constantly looking for work and being unsuccessful, around the age of 23, my mom looked in at other opportunities for me to get into because at the time going back to school was not the best decision in my life, knowing where I was heading, such as living with other people, having no food at times to eat, I wanted to start living the kind of life I knew my parents wanted me to have, coming from foster care. After continuing my job search I got a call from my foster mom and she told me that one of her friends knew about the Community Council of Metropolitan Atlanta program called the (PMI) Priority Male Initiative. At the time I never heard of or knew a program like this existed for young black males between the ages of 18-28, such as myself. She recommended that I look into the program seminar they hosted at the public library in my neighborhood. Going into the seminar, I found out the PMI was going to be a 16-week program that taught some of the skills I knew I lacked such as public speaking, self awareness, overcoming the odds, financial literacy, dressing for success as well as other educational skills. I knew it was something I wanted to be a part of because it was like going back to school and learning lessons about the things they don’t teach in grade school. After applying for the PMI and getting accepted, I still had no family support on how I was going to be getting to class everyday. I was happy to learn that the PMI would provide weekly MARTA cards for all of us to attend classes four days a week. A couple of times, I lost my MARTA card. Being that I was determined for success and wanting more from life, and myself I would wake up in the mornings and walk to the PMI which took over 1hour and 15 minute trip coming from home to school. I knew that by doing this as my motivating to success great reward would soon come. After I enrolled in the PMI, I began to see a change about my life, the way I wanted people to view me, my public speaking ability, and gaining life lessons that I lacked. I faithfully attended classes four days a week, actively participated in sessions, went on all field trips, and completed all of my written assignments to the best of my ability. My classes included self management, heritage lessons, interpersonal relationships, conflict resolution, financial literacy, communication skills, vocational exploration, the criminal justice system, and much more. Our field trips included The State Capital, Fulton County Court, Morehouse College, Atlanta Metropolitan College, Strengthening Families and Communities conference, a fatherhood conference, and a True Colors Theatre production. The PMI also opened up other opportunities for me when our class was introduced to Year Up Atlanta, and we were encouraged to apply for the program. I knew this was another program that I wanted to be a part of, and I applied for admission and was accepted. In February 2011, I successfully completed the 16-week PMI program and graduated in the top of my class in rank number 1, and also graduated class president. I enrolled in the Year Up program in March of 2011, which was a one-year intensive Information Technology training program. I really got another life changing experience at a program that taught life lessons, communication skills, business communication, and computer skill courses while dually enrolled at Atlanta Technical College for college credits. Being at the Year Up program really gave me insight of how it really is working in corporate America. After the 4-month learning and development stage, I earned a 6-month internship as a Project Administrator. I completed the Year Up program and graduated in January 2012. After graduating from Year Up, I found employment with a staffing company, with my certification in Computer Science, but life once again struck and I was laid off. However, I was too determined and dedicated in life for things not to be going my way or adding up for that matter. I found another job opportunity working at a Pharmaceutical Warehouse, where I found myself again being dedicated and determined to better myself and my life, I then had to buy a bicycle to ride to work, whether in the seasonal weather conditions. Even when I got a flat tire, I would run the bike to work to avoid being late. I am still employed with this company and also work a part-time job. I see now the PMI and Year Up programs I graduated from not only disciplined me but also brought character. The Community Council of Metropolitan Atlanta is still in my life. Ms. Barnes has invited me to participate in some of their community programs, and I have even served as a volunteer at programs. A PMI Mentor, Mr. Morton, is also working with me. I greatly appreciate the PMI program of the Community Council of Metropolitan Atlanta, because it gave me the skills and education I needed to move forward in life. It also helped me recognize the mistakes I was making on jobs, and turned me around to avoid the repeat. New doors and opportunities opened for me that would have been closed or I would have never thought would be there for me to grasp. Because of the PMI, I am able to keep my full time job, learn from the lessons I didn’t have before to keep and maintain a job, become more patient about what life has thrown my way, and keep the skills I have learned and apply them in situations to come.